I generally do “blasts from the past” when I either don’t have anything specific I want to blog on on a particular day or when I’m not feeling well and am just not up to writing something new. Today is the latter case. All achy and stuffy today. People keep making the claim that a gun in the home is more likely to be used to kill a friend or family member than it is to be used in self defense. 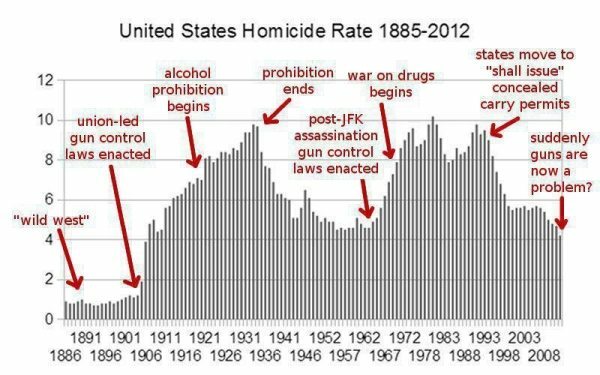 This all derives by a “study” by Arthur Kellerman which has long since been debunked but its fake statistics nevertheless continue to be cited by anti-gun propagandists. On the one side: He only counts as “defenses” dead criminals when in truth in most cases where a gun is used in self defense merely presenting a gun is sufficient to end the threat. When the gun is fired, most of the times the person shot survives. This is even more the case in defensive shootings because when a person means harm, they are more likely to keep shooting until the target is dead whereas in a defensive shooting a person generally stops when they believe the threat is ended (and, in fact, is legally required to do so). So, the number of uses of a gun in self defense in the Kellerman study is low by orders of magnitude. The other thing that gets added in is suicide. However possession of a firearm only really affects choice of method rather than suicide itself. Japan, for instance, with its essentially gun-free society has a suicide rate higher than our suicide and homicide rates combined. Looked at dispassionately we find that studies of gun use in self defense produce a low value of about 800,000 per year. The high value is 2.5 million. It’s hard to get a definitive answer to the question because see above: most times in a defensive use the gun is never fired. As a result, this means that most gun defenses are never reported to the police. In any case, most studies of the issue return results of 1 to 1.5 million gun defenses per year. However, even using the lowball estimate of 800,000 that’s quite comparable to the number of times guns are used criminally in the US. So, far from having a gun in the household making one at increased risk, one is instead about as likely (again, using that lowball result) to use a gun in self defense as to be threatened by a gun. More, actually since “gun owners” (the only population where one is able to use a gun in self defense) < “total population” (the population at risk for criminal use). Being criminally threatened with a gun has a risk of about 800,000 out of 321 (or so) million. Using a gun to defend oneself has a risk of about 800,000 (lowball again) out of 70-100 million. The latter is at worst three times the odds of the former. Or look at it more simply. Gun ownership in the US has grown by leaps and bounds. The spread of “shall issue” and more recently “constitutional carry” means more people are carrying more guns in more places than ever before. If the “gun ownership increases risk” had any merit then we would be seeing homicide and violent crime going up. But that’s not what’s happening. It’s been going down since the 90’s and is currently at a 100 year low. The simple truth is, the violent have been with us since the beginning of humanity. The violent have several inherent advantages. They get to choose time and place. They get to choose victims (generally choosing those smaller and weaker than themselves). What firearms do is level the playing field. With a gun, aged Aunt Millie is the equal of 6′ 4″ 300 lb, Joe Thug on Steroids. Guns are, therefore, a net good to society. An abusive ex shot in self defense is known to the person doing the shooting. My mom went to an AI school; made three new friends– a sweet older couple, and a gorgeous young lady. She’s only friends with two of them, now, because a week after the class ended the young lady was beaten to death by her freaky ex boyfriend, who she’d left months before. She literally had the restraining order in her pocket when her body was found. Mom gave her the number to a good gun dealer, and it was probably sitting around there, somewhere. When you recognize that, though, you have to start looking at the cultural expectations and stuff like the fact that sympathy/chain suicides exist, and the spike in teen suicide after that damnable miniseries came out– and that might lead to you considering if other cultures might possibly have different standards for violent response, and that would rather destroy the whole theory, no? It’s hard to get a definitive answer to the question because see above: most times in a defensive use the gun is never fired. As a result, this means that most gun defenses are never reported to the police. My gun use that wasn’t reported– I was at home and an obviously…um…mentally different, I THINK from drugs, woman tried to break down the door. I grabbed a gun before going to the window and demanding what the hey. What am I going to do, tell the cops “yeah, I brandished a gun in my own window when a crazing @#$#@ was trying to bust down the door”? I do not THINK so! Previous Previous post: Department of Education? Why? Next Next post: Robots are going to put us all out of work!